Once a heavily guarded trade secret, the Balducci Levitation has become a classic weapon in every street magician’s arsenal. The magician gathers his audience closely around him, the better to see this miracle occur. “Watch closely now” he says and looks down at his own feet. After a moment of anticipation, the audience gasps as the magician’s feet float off the ground a few inches, hover in defiance of nature’s laws and then quickly drop to earth. Good balance and the right angles hide the secret of the Balducci Levitation, which is simply that the magician pushes off the ground with the toes of one foot, cleverly hidden from view. An anytime, anywhere illusion, the Levitation only requires practice and the proper awareness of angles. No advance preparation is needed beyond a great deal of practice. It is key here to have the right angles. If you have too many people surrounding you, if you have an audience that does not follow where you lead, or if you fear you may be spotted from afar then do NOT perform this trick, or you will ruin it for yourself and other magicians. 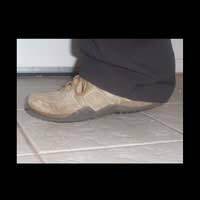 By angling the body in such a way to hide the toes of the right foot, the appearance of levitation is achieved by pushing off the ground with the hidden toes while keeping the left foot perpendicular to the ground. When practicing the magician should work on his balance. Falling over suddenly in the middle of the levitation would ruin the effect, as would having to take a step to catch your balance. Wobbly feet or feet that drag or hang, likewise will ruin the effect. A masterful presence is required for the levitation. The magician will need the audience to look exactly where he wants them to look. After having a few people gather closely, the magician turns his body at an angle, so that his left foot is about 45 degrees turned away from the group’s point of view. The right foot should be slightly back from the left, so that the right heel is visible next to the left. After a moment’s hesitation, the magician pushes up with the toes of the right foot, raising the right heel in tandem with the left foot. It will appear as if the magician’s body just lifted about four inches off the ground by itself. The angle will hide the fact that the toes of the right foot are still in contact with the ground. After only a few seconds, the magician should quickly lower his feet to the ground. It should be a controlled fall, as if the force of gravity suddenly became too much to fight off, but the magician is still fighting it all the way. The effect is powerful, if brief and should never be done for the same audience, as there is too much of a chance one or more will not be watching the feet but looking for how the trick is done. The best way to fool the audience is to catch them unawares. Do not tell them you are going to float or levitate; just tell them they are about to witness something very magical.